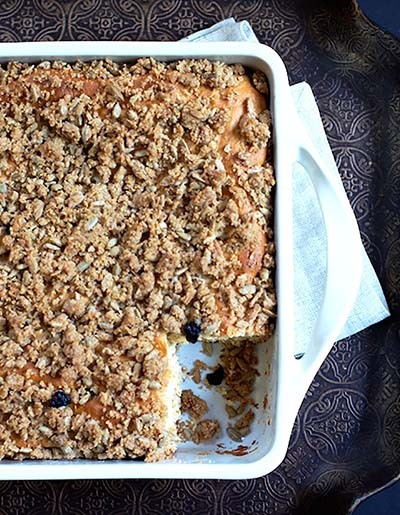 Start the day right with this easy coffee cake - granola and sunflower nuts add a nice crunch. In large mixer bowl, combine 1½ cups flour, yeast, granola, sugar and salt; mix well. In saucepan, heat milk, water and shortening to 120-130°F (shortening does not need to melt); add to flour mixture. Add eggs. Blend at low speed until moistened; beat 3 minutes at medium speed. By hand, gradually stir in remaining flour to make a stiff batter. Cover; let rise in warm place until light and doubled, about 45 minutes. Prepare Topping by combining all ingredients; mix well. Stir down batter; spread evenly into greased 13 x 9- inch baking pan. Sprinkle with Topping; with back of teaspoon, press into batter to make random indentations. Cover; let rise in warm place until light, about 30 minutes. Bake in preheated oven at 375°F for 30 to 35 minutes until golden brown. Serve warm or cold. This recipe is featured at Food Wanderings.